Bearded Dragons are gentle, intelligent and confident lizards, which makes them interesting and rewarding pets. They grow to around 600mm in length and show real personality. They are easy to care for and are regularly bred in captivity. They are naturally found in arid regions of Australia and have an average lifespan in captivity of 8-10 years, although they can live to be as old as 17. Bearded Dragons are large and active lizards so should be given a large vivarium, a minimum size of 1200 x 450 x 450mm (48 x 18 x 18″). A wooden vivarium is recommended as they are better insulated than glass or plastic vivariums, making it much easier to get the heating set up correctly. A wooden vivarium will offer more privacy for the dragon, as they only have a glass front. Bearded Dragons require a temperature range of up to 45°C (113°F) in the basking area, down to approximately 30°C (86°F) in the cooler area. This will provide the dragons with a temperature gradient across the vivarium, allowing them to choose the most suitable temperature at all times. At night the temperature can drop to 20°C (68°F), so in most modern, centrally heated houses no extra night time heating will be required. These temperatures can be achieved by using basking lights during the day and a ceramic heater at night, if necessary. A thermostat should always control the ceramic heater. Ideally basking lights, in particular ones with a higher wattage, should be controlled by a separate thermostat. It is very important to know what the temperature is, so check regularly with an accurate thermometer. Ideally use two maximum/minimum thermometers per vivarium (one at each end of the vivarium), or you can use an in/out, max/min thermometer and place 1 sensor at each end. Do not guess or take temperature by hand (if it feels warm or cold), this is not accurate enough. Bearded Dragons require a good quality UV light to help use calcium from their diet and prevent Metabolic Bone Disease. We recommend using a 10-12% T5 UVb. UV lights should be mounted directly above the dragons, at a maximum of 12 inches above the main area. It is recommended to replace UV lights every 6-12 months (depending on brand of lamp) due to a decline in UV output. Basking lights are essential to provide heat as well as white light to encourage normal basking behaviour. A simple 12 hour light cycle is ideal for a Bearded Dragon. It is important to provide your dragon with fresh water every day, in a shallow bowl to help the Beardy and crickets climb out of the water. Although bearded dragons are from arid regions of Australia they are prone to dehydration. To prevent this, it is important to spray your dragon with water as this is how they would normally drink in the wild. You can also give a warm water bath once or twice weekly/as required. Don’t spray your beardy more than once a day as this will raise the humidity and can cause respiratory problems. Bearded Dragons require a few branches and rocks to climb on. The vivarium can be decorated with plastic plants as these look very attractive and offer some privacy. These will also be used by the crickets and locusts to hide in, encouraging your dragon to actively hunt them. Live plants however are a poor choice, as the heat will kill them very quickly and the dragons and crickets will eat them. A suitable nesting box should be provided when keeping female Bearded Dragons. It needs to be large enough for the dragon to get fully in and dig around in (approx. 45 x 30 x 30cm), and should be filled with a damp mix of coconut fibre substrate and sand. Bearded Dragons are omnivorous, so require a mixed diet of insects and salad. Leafy salads, such as Rocket, Water Cress, Dandelions and mixed salads are readily available and easy to use. Try to offer variety to keep a balanced diet. Salads should be offered every day. 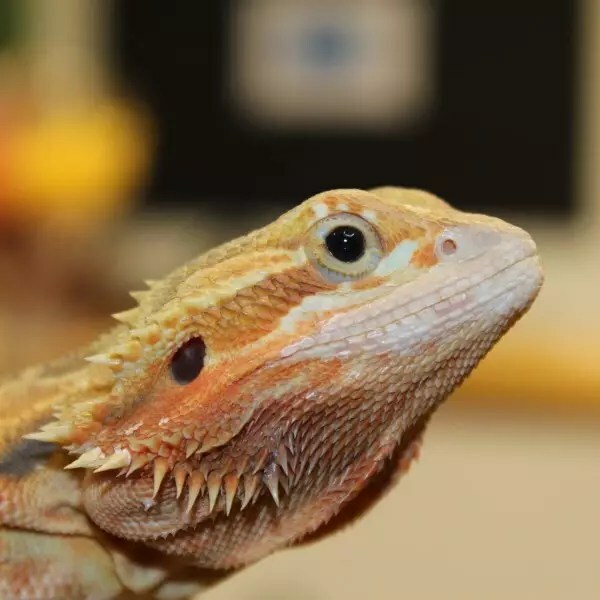 Beardies will eat crickets, locusts, mealworms, and wax worms. Crickets and locusts should be used as the main foods, as they are lower in fat than wax worms and easier to digest than mealworms. Regular use of vitamin/mineral supplements is very important to prevent problems such as Metabolic Bone Disease, which is a calcium deficiency. This is a serious condition and can occur very rapidly in young dragons that are growing quickly. 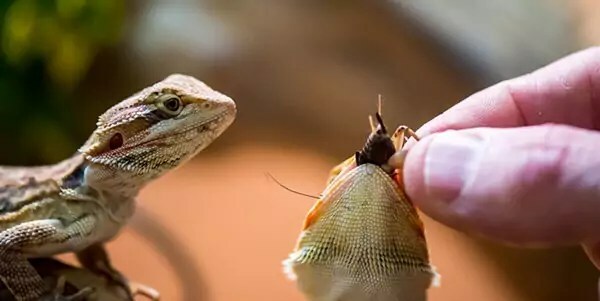 Insects should only be offered to Bearded Dragons every other day as this encourages them to eat more of their salad. Young Bearded Dragon should be fed 80% insects and 20% salad. From 1 year of age this changes to 20% insects and 80% salad. Bearded dragons can produce quite a lot of waste so the vivarium and decorations should be cleaned regularly. Clean and refill the water bowl on a daily basis. Depending on cage conditions, remove all substrate & cage furniture and completely disinfect using reptile safe disinfectant. Rinse the enclosure thoroughly and allow to dry before replacing cage furniture and your dragon. Bearded Dragons shed their skin as they grow and will do so a little at a time. They rarely have any problems shedding. Bearded Dragons are rewarding pets to keep – but be prepared for the amount of food and space they require. Bearded Dragons - In store now!